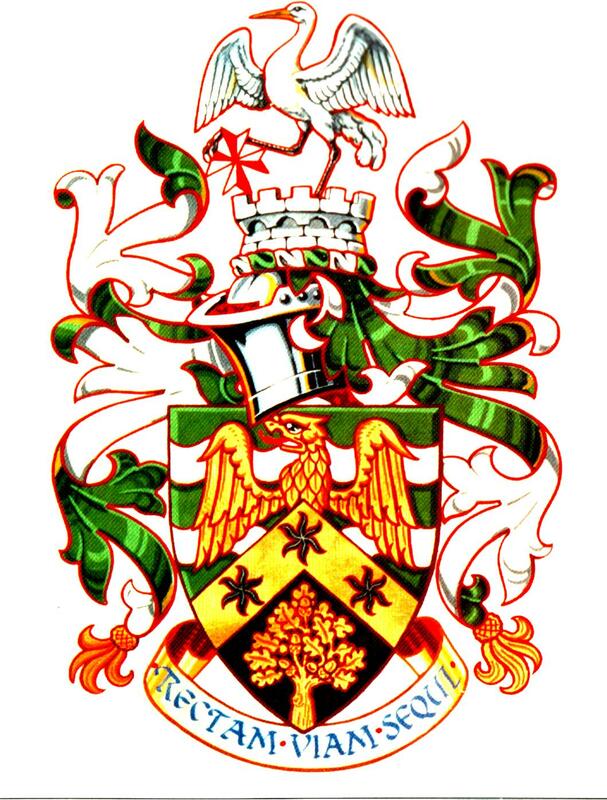 THE ARMORIAL BEARINGS OF THE NORTH KESTEVEN DISTRICT COUNCIL. BLAZON Arms: Per chevron vert and sable, on a chevron or between in chief two bars wavy the neither issuant argent surmounted of a demi eagle issuant displayed wings inverted or and in base an oak tree issuant fructed or, three estoiles sable. Crest: On a wreath argent and vert out of the battlements of a tower a crane wings expanded and inverted proper supporting with the interior foot a Maltese Cross resting upon the battlements quarterly gules and argent. 1. Composition: This design comprises shield and crest, as in the case of all three constituent authorities and motto. The shield combines elements from those of the three district councils and the crest commemorates notable features of the whole new area. 2. Description: The upper part of the shield features the green background, two white waves, and the top half of the golden eagle from the arms of North Kesteven Rural District Council from which the new District takes its name. The waves denote the River Witham (also depicted in the East Kesteven Rural District Council shield) and the River Brant in the agricultural countryside. The eagle refers to the numerous Roman associations of the area - the Fosse Way, Fosse Dyke and Ermine Street, which for part of its length forms the common boundary of North and East Kesteven. The lower part of the shield is that of the East Kesteven shield - a gold oak tree taken from the Kesteven County Council arms, representing the forests, remnants of which still survive in the south of the old county. Between the North and East Kesteven emblems is the gold chevron with three black stars from the arms of Sleaford Urban District Council, which are taken from those of the distinguished Carre family. The three stars also indicate the union of three authorities in one edifice, suggested by the gable-end shape of the chevron. Upon the shield stands the closed helm proper to civic arms, with its crest wreath and decorative mantling in the basic green and white of the shield - the liveries of Kesteven County Council. Upon the wreath is the crest, which shows the crane from the East Kesteven crest representing the important R.A.F. College at Cranwell (also commemorated in the Sleaford crest by an eagle). The crane stands within the battlements of a tower alluding to Somerton Castle, a 13th century residence of the Bishops of Lincoln, and rest a claw on a cross combining the red Maltese Cross of the Knights Templar and the white one of the Knights Hospitallers, who had establishments at Mere in the North. The crest thus combines influential institutions in the life of the area in both ancient and modern times. The motto is that of the previous North Kesteven Rural District Council, 'Rectam viam sequi', a quotation from Cicero. It may be translated 'To follow the right road' and also 'To follow the straight road', the latter giving a reference to the Roman roads of the area. 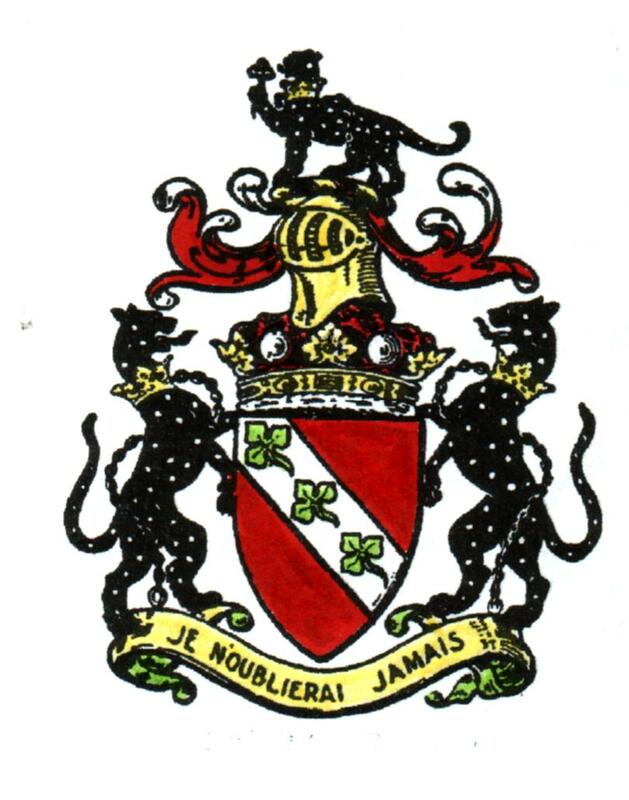 THE ARMORIAL BEARINGS OF SLEAFORD TOWN COUNCIL. BLAZON Arms: Gules on a Chevron Or three Estoiles Sable on a Chief Argent as many Trefoils slipped Vert. Crest: On a Wreath of the Colours an Eagle wings extended and head downwards and to the sinister proper holding in the beak an Ear of Wheat stalked and leaved Or. Granted 26th October 1950, to the Sleaford Urban District Council. 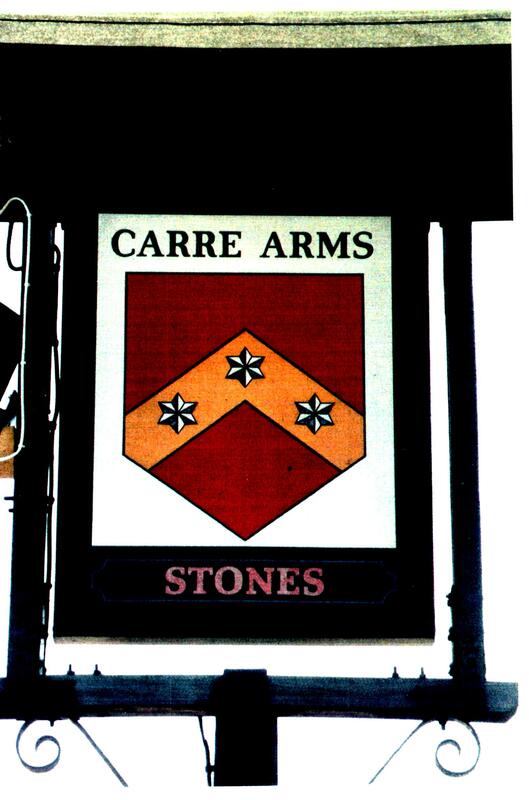 The lower part of the shield consists of the arms of the Carre family, the great landowning family which was actively associated with the town of Sleaford in the 16th and 17th centuries. 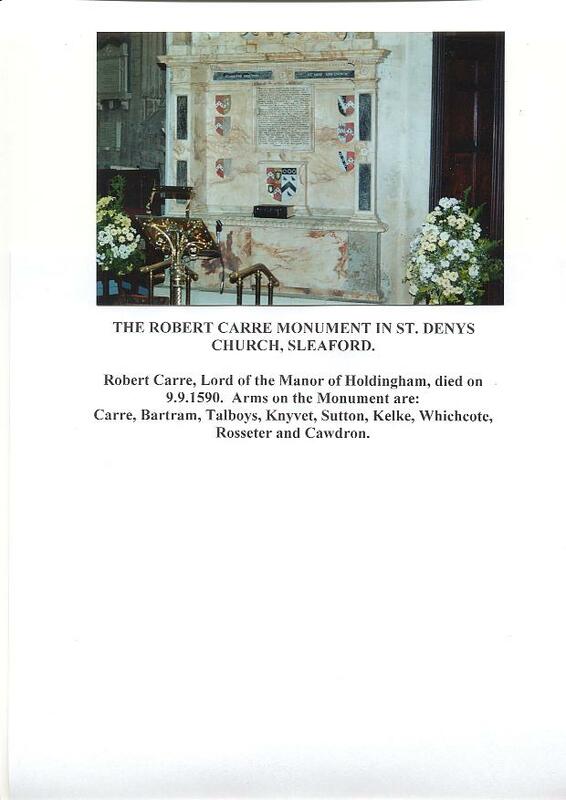 Robert Carre of Aswarby founded the Carre Grammer School in 1604 and his nephew Sir Robert Carre Baronet who founded the Carre Hospital in 1636. The three green trefoils at the top of the shield come from the arms of the Harveys, Marquesses of Bristol. The Manor of Holdingham which includes a large part of Sleaford was held by several members of both the Carre family followed by the Marquess of Bristol's family for over 400 years. The eagle in the crest symbolizes the towns links with the Royal Air Force, particularly the nearby RAF College at Cranwell. The ear of wheat refers to the local agriculture. THE ARMORIAL BEARINGS OF THE MARQUESSES OF BRISTOL. BLAZON Arms: Gules, on a bend argent, three trefoils slipped vert. Crest: An ounce passant sable, spotted, ducally collared and chain reflexed over the back or, holding in the dexter paw a trefoil slipped vert. Supporters: Two ounces sable, bezantee, ducally collared, and chain reflexed over the back or. 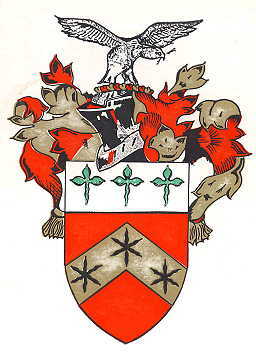 THE ARMORIAL BEARINGS OF THE CARRES OF SLEAFORD. BLAZON Arms: Gules on a Chevron Or, three Estoils Sable.